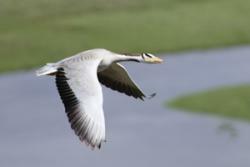 Bar headed goose in flight: Image credit:Nyambayar Batbayar, Mongolian Academy of SciencesBar-headed geese are star fliers of the bird world. As well as being striking looking creatures, they have become famous for making incredible annual migrations over the world’s highest mountain peaks, the Himalayas. This spectacular migration seems even more arduous when you consider that oxygen levels at such high altitudes plummet to less than half their value at sea-level and temperatures are far below freezing. Humans that scale the world’s highest mountains without oxygen can usually only take a few steps at a time before needing to recover, while the bar-headed goose was famed to fly on past, honking as it went. “It all didn’t quite add up though” said Dr Charles Bishop, of the School of Biological Sciences, who is the principal investigator of research into the birds’ migration. “Bird flight uses huge quantities of oxygen and would need even more at the top of the Himalayas than at sea-level, but much less is available at such high altitudes. Why not just follow the valleys that skirt around the highest peaks?” Indeed this ‘paradox’ has troubled biologists for more than 30 years. 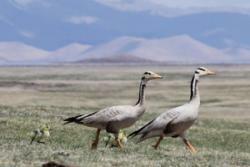 Bar headed geese and goslings: Image credit:Nyambayar Batbayar, Mongolian Academy of SciencesA study published this week (31 October 2012) in Proceedings of the Royal Society B: Biological Sciences has tackled this long-standing problem using state of the art satellite tracking technology. Scientists from Bangor University and an international team of collaborators recorded highly accurate GPS (Global Positioning System) locations from 42 individual geese as they migrated. “We know that in general, animals don’t expend any more energy than they have to” said Dr Lucy Hawkes, the lead author of the study “so we would predict that geese should choose to fly as low as possible over the Tibetan Plateau and should make use of any tailwinds in the area for a little boost of speed”. And that’s almost exactly what the study authors found. The geese chose to fly relatively close to the undulating terrain but they generally got on with it regardless of what the wind was doing. While this means that extremely high altitude flight in this species may be rarer than previously thought, these large birds regularly fly between 4,500m and 5,500 metres above sea level, with maximum recorded heights of 6,540m and 7,290m, an incredible feat that still marks it out as one of the wonders of the natural world. 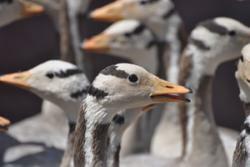 Bar headed geese: Image credit:Nyambayar Batbayar, Mongolian Academy of SciencesThis work was carried out with funding support from the Biotechnology and Biological Sciences Research Council and the Max Planck Institute for Ornithology. The project is partnered with Birmingham University, the Bombay Natural History Society, the Chinese Academy of Sciences, the Mongolian Academy of Sciences, McMaster University, the Qinghai Lake Nature Reserve, the United Nations Food and Agriculture Program, the United States Geological Survey, the University of British Columbia, the University of Tasmania and the University of Exeter, UK.